Weight loss. Infected gums and tooth pain can result in a reduced appetite and significant weight loss. Bad breath due to the bacteria living on the teeth and gums. Dirty, stained teeth that could be harboring bacteria. Heart, kidney and liver disease which can all arise from untreated dental infections. Premature death. Bad teeth and gums can actually shorten the life expectancy of your pet. One of the primary causes of these problems is gum disease or Gingivitis. This is a term for the inflammation caused by bad-breath causing bacteria that grow on tartar and calculus. Gingivitis can cause pain, irritation, and potentially even bone and tooth loss in your pet’s mouth. The bacteria can even enter the bloodstream and cause damage to other organs such as the heart, liver or kidneys. These can be serious problems! Research has shown that dental disease is the primary health concern for cats, with around 70% of felines aged over 3 experiencing some form of dental problem. Between 4 and 6 months of age, kittens lose their baby teeth and develop their permanent ones. Once the permanent ones are present your cat should have around 30 teeth. Doggy dental care is also extremely important. Most adult dogs will have 42 teeth by the time they are 7 or 8 months old but many show signs of gum disease by the time they are 4 years old due to a lack of proper cleaning. 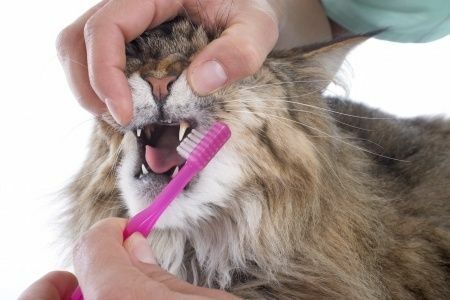 Brushing your cat or dog’s teeth as a part of their regular daily routine can help prevent the onset of oral decay. There are plenty of pet brushing kits available, or you could use baby toothbrushes, gauze or a small towel wrapped around your fingers. Pet toothpaste is not necessary but can be useful as it is tasty and can make a better experience for your pet. Please do not use human toothpaste as it can make pets very sick! Dental prophylaxis, otherwise known as a clean and polish, is the most routine dental treatment performed on cats and dogs. It is very similar to when you visit the dentist! It usually takes around 45 minutes and there is no need for your pet to stay with us overnight. Whilst all dental work requires that your pet has a general anesthetic, the risks are minimal and we require pre-anesthetic blood work to ensure your pet is healthy enough for surgery, and we may recommend x-rays to look at his or her lungs and heart if there are additional concerns. Once your pet is under anesthesia we will take full dental x-rays of all the teeth so we can look at the health of their roots and bone. We then start with the scaling and polishing of their teeth performed by an experienced veterinary nurse. The veterinarian will then examine all teeth and the oral cavity and will make recommendations for any teeth that need to be removed at that time. You will be called if you have not already given permission for extractions. After recovering you can pick up your pet usually by early afternoon. Depending on the procedure we may recommend special food or aftercare which we will discuss at your discharge appointment. Some places offer anesthesia-free dental cleanings. Please be aware that these cleanings can whiten teeth, but they cannot accomplish the bacterial and tartar removal around the gums, so the existing dental disease is still there. We know anesthesia can be scary, but it is necessary to ensure a full cleaning and exam of your pet’s mouth. Dental extractions should always be performed under anesthesia. See what current promotions we have available for your pet!